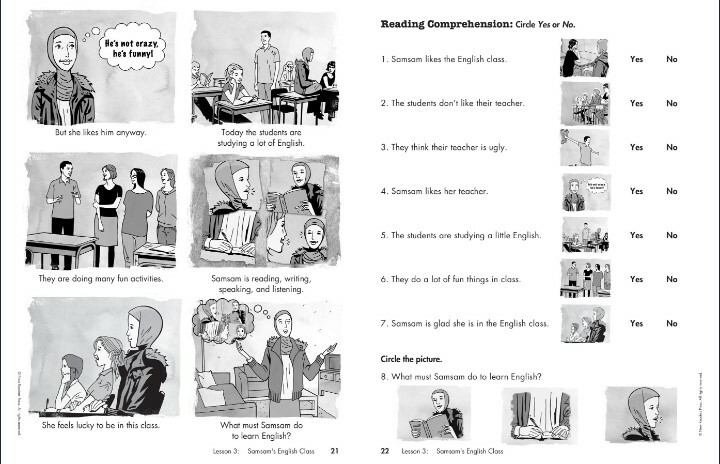 The What’s Next series, by New Readers Press, is a unique multilevel phonics approach for English Language (ESL/ELL) Students. What’s Next? are easy-to-read stories that follow Samsam, a Somali immigrant, through her daily life in the U.S. where she is faced with learning English, finding a job, visiting a doctor, and more. Each level contains the same story which makes it ideal for multilevel teaching. Every lesson in What’s Next? takes learners through listening, speaking, writing, vocabulary, prediction, and reading comprehension exercises. Phonics instruction is a core part of each lesson, and students acquire new vocabulary with both phonics and sight word practice. Research-based, phonemic awareness listening practice sets this multilevel series apart from other English language learning products. Each lesson introduces target vowel and consonant sounds, blends, endings, and 10 sight words. Learners first focus on the story as a whole, then work on the phonics and sight words, and finally return to the whole story again to access comprehension and learning. Students practice beginning and ending consonant sounds, complete exercises, and learn new word families. The Teacher’s Guide includes lesson plans and reproducible masters for each lesson. Audio files for each story are recorded at two speeds for learners in a multilevel classroom. Download FREE audios on this page.